150 girls from Brownie units across Shropshire were among the first to take part in Pillows and Piliots; a sleepover event organised in conjunction with the RAF Museum at Cosford. The Brownies packed their sleeping bags and had the opportunity to sleep under the aeroplanes last weekend (11th February). 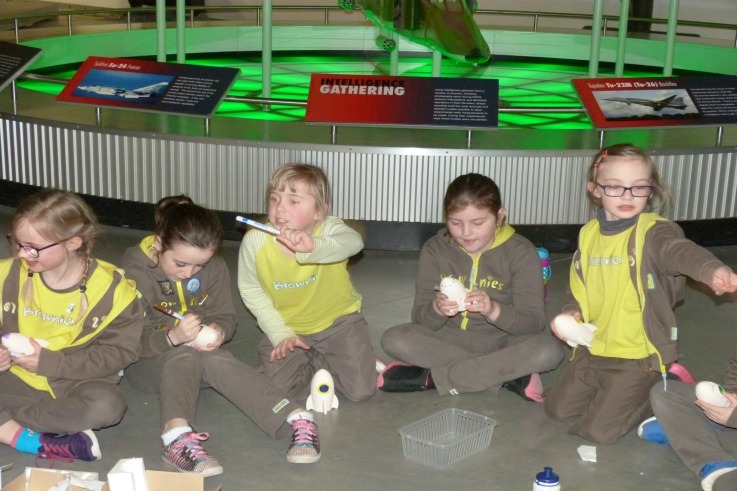 The girls were able to take part in lots of activities during their event, such as plane themed crafts as well as exploring all that the museum has to offer them. To round off the day, and before settling down in their sleeping bags, the girls were treated to a late night movie screening. Leader Marie Ruscoe said: The girls enjoyed all of it; the crafts, the film and sleeping amongst the planes and vehicles. I thought it was very well organised and a successful event. Pillows and Pilots was a joint event between RAF Museum Cosford and Girlguiding Shropshire and the event, which was for Brownies (age 7-10), was held at The RAF Museum, Cosford. The event, which was the first of it’s kind, will be running in the future to offer youth groups the opportunity to experience a sleepover in an unusual location.